Crystal Paul has written a great post on Bustle entitled “13 thoughts everyone has when trying to narrow down her pile at a bookstore.” The memes with this post are a must see for booklovers and if you are like me and still prefer a paperbook to an ebook, then this post is a must read. Last March, I wrote a post lamenting that most thrillers just weren’t thrilling anymore. I wrote that they seemed formulaic and that there was too much action and not enough story. This usually leaves me skipping large sections, just to get past the action and on with the story. Well, I have to say I have found the best thriller I’ve read in a long time. I could hardly put it down. 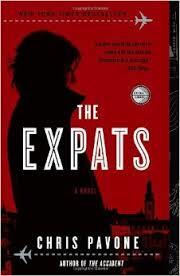 The Expats has been out since 2012, but I just picked it up for the first time last week. The story revolves around Kate (not Katherine) Moore, an ex-CIA agent living as an expat in Luxembourg and Paris (the story shifts around place and time wise, so be ready for this). Kate is adjusting to her new life as an expat, a life that is much different that her life as a working mother in the Washington, D.C. area. Her life is filled with play dates and coffee with the other mothers, leaving far too much time to observe others. When she meets Bill and Julia, another expat couple in Luxembourg, she begins to suspect they are something other than the usual expat couple. Not just a former interior designer and her highly-skilled businessman husband. Soon her extra time leads her to suspect that her own husband, mild-mannered Dexter, may be someone else as well. Disclaimer: I received this book from Blogging for Books for this review. All opinions expressed are my own. Book Details: Published by Broadway Books (January 2, 2013), 352 pages, ISBN: 978-0770435721. A portion of the proceeds from the sale of Dogs of Cape Cod will go to the Animal Rescue League of Boston’s Brewster shelter.